Expect the Joseph chair to become a media favourite in the next months. Felt is ‘unfortunately, very fashionable’, points out its creator Lothar Windels. 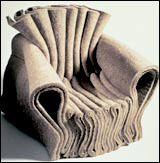 But beyond its modish appearance, the chair is an admirable piece of structural seating in which the frame and the upholstery is one, soft felt object, or as Windels puts it: ‘What you see is what you get.’ Over time, the felt will gradually change shape, yielding to the body weight of the sitter who will literally leave their trace on the design, personalising it through wear. With an educational background at Rhode Island School of Design, work experience with Dakota Jackson and forthcoming projects with Inflate and Umbra Inc, the German-born Windels seems to be well set for the road to design stardom. His uncompromising attitude towards his work has prompted Vitra to sponsor the production of the chair, one of which will be donated to its museum. Windels is also showing a design called C4, a contract furniture chair whose spring mechanism of tubular steel underneath a plywood seat creates a light and compact combination. If money was no object, Windels would happily self produce his felt chair, but ideally sees himself as a designer lending his talents to manufacturers such as Vitra and Kartell where he could have ‘unlimited access to the newest technologies’.